‘Tis the season to be grateful! 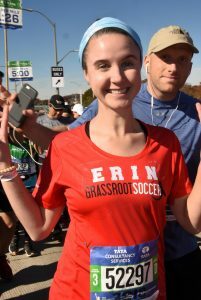 Year after year, mile after mile, Grassroot Soccer (GRS) supporters are pounding pavement, tackling trails, and taking on bike tours in support of adolescent health. 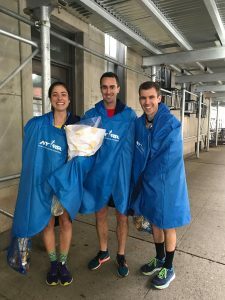 The runners on Team GRS who participated in the 2018 TCS New York City Marathon approached the event with enthusiasm, dedication, and their fair share of unique pre-race traditions. These are just a few of our dedicated runners! What was the most rewarding part of running on Team GRS? Knowing I was running for a cause that hits home on so many levels. Do you have any quirky pre-race rituals or superstitions? I always run with old medals from other races. Adolescence is a tricky time. What advice would you give to your younger self? Why did you not start running 10 years ago? What advice would you give to people who are thinking about running in a future Endurance Event with GRS? DO IT DO IT DO IT – You will learn so much about yourself, and how amazing your body actually is. How many marathons have you run? 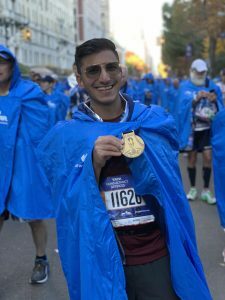 This was my second NYC marathon (and my second marathon ever)! How did you hear about Team GRS? I’m a lifelong soccer player and now a volunteer youth soccer coach. I’m also a huge fan of the women’s game (both the USWNT and the NWSL), I actually heard about Grassroot Soccer through one of my favorite players, Christen Press, and began learning more and more about the organization. When I got the inkling to run another marathon, Team GRS was the first thought that popped into my mind! What was the most rewarding part of running on Team GRS? Running for something bigger than myself. Every time I got tired (mentally or physically), I had a bigger purpose that kept me going during the long months of training and the race itself. Plus, spotting other Team GRS runners and supporters throughout the 5 boroughs was super fun! What advice would you give to people who are thinking about running in a future Endurance Event with GRS? DO IT! Finally: What was the highlight of your Team GRS experience? Having my friends, family and coworkers who donated to the cause continuously comment on how amazing Grassroot Soccer is and how much it meant to receive a personal “thank you” call from the organization. You go above and beyond each step of the way, and I was proud to represent Team GRS! 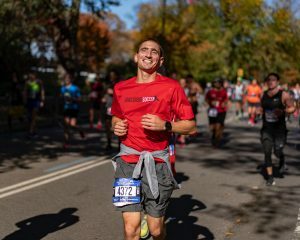 Now that you’ve run NYC, would you do it again? Yes! How did you hear about Team GRS? 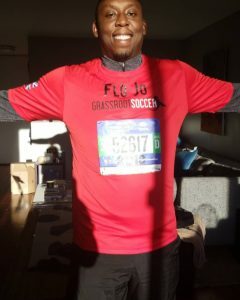 [Fellow Team GRS runner] Josh E.
Adolescence is a tricky time. What advice would you give to your younger self? Be ok with not being perfect. Finally: What was the highlight of your Team GRS experience? As always, running through the greatest city in the world with an incredible cheering squad – millions strong! – and being able to run with superstars like Josh [E.] and his dad. Now that you’ve run NYC, would you do it again? Most definitely. What was the most rewarding part of running on Team GRS? Being even a small part of something as big and awesome as GRS. Do you have any quirky pre-race rituals or superstitions? Always one beer the night before. Adolescence is a tricky time. What advice would you give to your younger self? Know that the things you think are impossible today will seem commonplace tomorrow – and the things you think are impossible tomorrow will be commonplace a decade from now. Something “hard” is just something you haven’t tried, practiced or learned yet. What advice would you give to people who are thinking about running in a future Endurance Event with GRS? You can do it. The coolest part of a big marathon like NYC or Chicago or Boston is that when you get to the start village or the expo the day before and you look around, you realize that there are thousands of people from all different walks of life, all different fitness levels, all different motivations for being there. And in that realization, there is a great deal of comfort that you too can do it. There is an overwhelming sense of communal “we got this!” and that’s really cool, and pretty rare in life (I think). You don’t get to share a sense of nervousness, followed by support, and then finally achievement with 50,000 people every day. Finally: What was the highlight of your Team GRS experience? Always the GRS team who makes it happen. Huge kilo to Pam for her efforts to organize the group, coordinate the weekend and keep everyone motivated through training. How many marathons have you run? Was this your first? I ran the 2013 Kilimanjaro Marathon in Moshi, Tanzania. This was my second marathon. Now that you’ve run NYC, would you do it again? I would absolutely run NYC again. How did you hear about Team GRS? 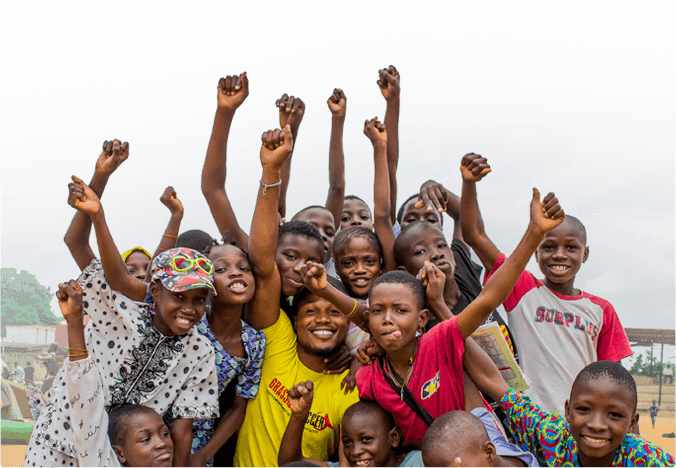 I heard about Grassroot Soccer when I was a Peace Corps volunteer in Tanzania. All the instructors were so enthusiastic and I loved hearing and learning about their work. When I was looking for a way to enter the NYC marathon, I was glad to join Team GRS. In one word, describe how you felt at the finish line: Exhausted. Adolescence is a tricky time. What advice would you give to your younger self? I would tell my younger self to sleep more! I was always tired. And read books, and keep a journal. How many marathons have you run? Was this your first? I’ve run over a dozen marathons and 7 ultra-marathons. What was the most rewarding part of running on Team GRS? Meeting all of the other incredible runners at the pre-race dinner, and knowing that every dollar raised goes towards the incredible work GRS is doing with its curriculum and many initiatives in South Africa. Do you have any quirky pre-race rituals or superstitions? Don’t do anything new the night before or day of a marathon. Always pin your bib to your shirt before you go to bed. And always have strong coffee the morning of the race. What was going through your head at the starting line? Look at all these people from all over the world. Isn’t this incredible? Adolescence is a tricky time. What advice would you give to your younger self? What’s next is what’s best. What advice would you give to people who are thinking about running in a future Endurance Event with GRS? Train your body, but don’t forget to train your mind. Nearly every person is 100% capable of training for and successfully completing an endurance race. Be patient with yourself and push through the first 2 weeks of training…it only gets easier from there. Finally: What was the highlight of your Team GRS experience? Seeing my Dad run his fastest marathon ever and make it into The NY Times for finishing sub-5 hours. What was the most rewarding part of running on Team GRS? Team GRS is so supportive that the entire process felt like a community. I really appreciated that they reached out individually to my donors to thank them. Do you have any quirky pre-race rituals or superstitions? I always eat banana bread before a race! Homemade is the best. Adolescence is a tricky time. What advice would you give to your younger self? Think about what you want when you’re an adult, then try to think about what you need to do (or not do) now in order to achieve it. What advice would you give to people who are thinking about running in a future Endurance Event with GRS? The race itself is merely a celebration of all of the hard work you’ve put in while no one was watching. Finally: What was the highlight of your Team GRS experience? The people of New York cheering were the highlight of my entire experience. The crowd was amazing. Interested in joining Team GRS? 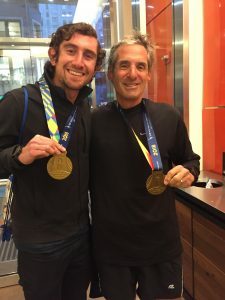 Spots for the 2019 Bank of America Chicago Marathon are available through November 30, 2019. Visit this link for more details. If you have another event in mind, feel free to pick your own event or challenge – supporters have run, biked, swam, climbed, hiked, and everything in-between. Decide on an event, choose your fundraising goal, and we’ll help you get there.